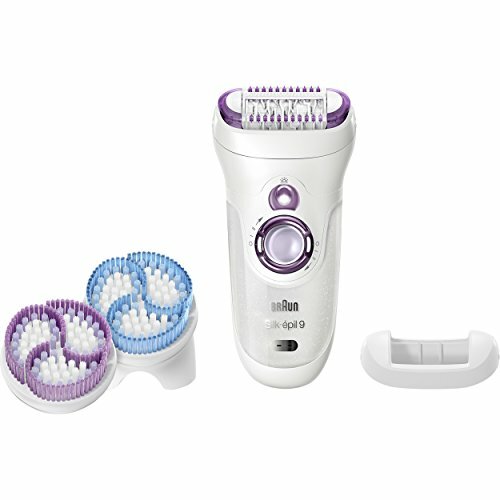 Can I use an epilator for Brazilian hair removal? But, this time I will skip the makeup and fitness talks. This time it is all about hair removal. Every woman struggles with this, so to say. There is always the dilemma of choosing wax, shaving, epilators, or even expensive laser hair removal. 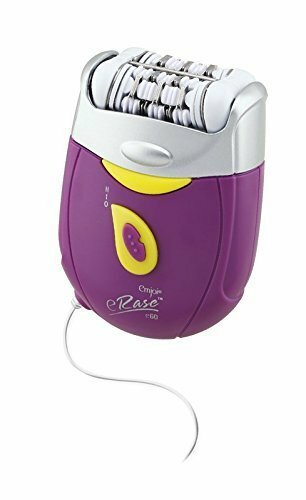 I always wondered – can I use an epilator for a Brazilian? For those that rarely go to salons or not at all, it is handy and practical to have a wax heater at home or even better – an epilator. Why? For unexpected pool party invitations at the last moment or maybe quickly removing facial hair without rushing to the salon for a quick appointment. I would love to help you out in choosing the best epilator for Brazilian hair removal specifically. This way you can stress less when you choose the best of the best for this summer of 2019! Of course. Technology is so developed, today’s epilators come with many parts to make the hair removing process better, more comfortable, less painful and some parts perfectly glide on delicate body curves. You might need some tips for epilating Brazilian way and this is how you can figure out which products fit you best. Skeptics might think that salon experts and waxing is the best option. But, with proper safety precautions and good parts of an epilator, you surely can do Brazilian hair removal at home. It might hurt a little bit different than with waxing but it is bearable. In a nutshell, we can and should since this product touches only our skin, not someone else’s. TIP: Do you have extra sensitive skin? Let’s be honest, all of us should answer YES if we’re talking about the bikini area. Buy a numbing cream, put it on before epilating. It WILL help, trust me! Before epilating exfoliate the skin. Try at all times to keep your skin taut. This way you feel less stinging pain. Work with the epilator in small sections at a time (again, less pain and better hair removal). Try to remove hairs when they are still as short as possible (yes, again for less pain). Longer hairs when removed, give you the feeling of ‘being plucked’. Pay attention to the epilator head – tweezers including rotating parts or safety caps are beneficial. If you have really special skin and can remove hairs only with water, get an epilator for wet usage. The warm water will make hair removal easier due to opened pores. Don’t panic if the skin after the epilation is a bit red or irritated. It is normal for it to be that way after removing hairs from the root of course! Just rinse the skin with water, try cold water to numb the redness and remove it fast. After the skin is fully dry, you can apply a mild lotion that would not clog pores – so use it in thin layers. Try to have a lotion with tea tree oil or Aloe Vera – best skin soothing items. Then just clean the epilator or its head (depends if it’s washable or not). Dust it off or rinse it for the next use. This product does a great job in hair removal with just one stroke, rarely a second one. The skin will be smooth for almost a month. It is comfy in the grasp of the hand and has long and wide tweezers for better and more precise hair removing. Can be used both for wet and dry hair removal (feel free to use it on wet skin after the shower). It has extra parts, even seven of them (trimmer, massage cap, shaver head, a cap for skin contact, and a brush for facial hair too). It removes short hairs where wax doesn’t work (better precision). You can clean it with water all over. It needs a full hour to charge. More effective for strong and dark hairs compared to fine hairs. 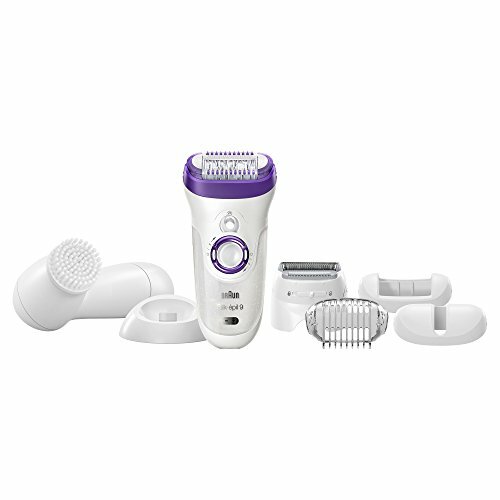 Overall, this epilator is a great quality product and comes with many handy items and extra parts. This might just be the best bikini epilator for coarse hair if all else fails. The first thing I noticed here with this product was the incredibly cute design. You will love the delicate decoration on this small handy epilator. To get that salon feeling or best at home pubic hair removal, this model by Philips could be a good idea. Removes short hairs (even 0.5 mm) straight from the root. It is corded and can be used anytime you need it. 2 speeds (slow and fast). Narrower epilation head than with other epilators. Cord design (plugged when you use it). Just one extra part (efficiency basic cap). This product would be perfect if you do all hair removal at home instead of salons. You won’t need batteries or charging since this is plugged in all the time and is ready for use whenever you need it. 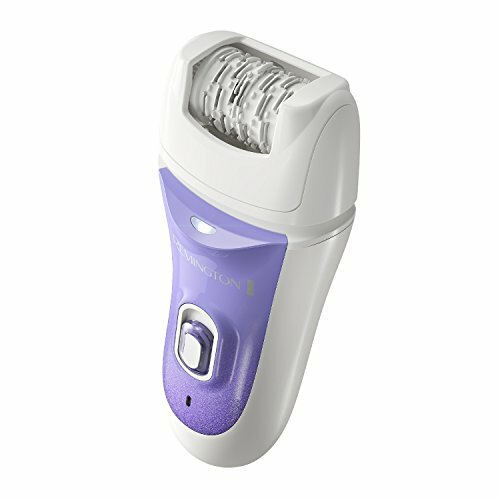 A classic-looking epilator with a wider head and shape that fits your hand well. It is attractive since it offers exfoliation for the skin too. Precise and fast as these products are, it has quite a lot to offer. Exfoliation along hair removal for complete skin pampering. Wide epilation head that has more coverage for 1-stroke hair removing. The brushes prevent ingrown hairs and rashes. Might be a bit aggressive for ashy/dry skin (due to the exfoliation brushes). A practical and nice item. The wide head removes more hairs on a broader skin area at once and you can take it with you wherever you go (charge it or use batteries), either way, it is handy and good quality. The good thing is that you won’t worry about exfoliation as well! With a deep crimson fiery red, this epilator pops and stands out from the rest. Looks quite small and simple, but it certainly does a great job and has some interesting features. The head has dual parts that do twice as much work for the unwanted hairs. Total of 72 tweezer heads in the main head part. Silver Ion Technology (prevents microorganisms to grow and spread). Dual heads (most epilators have one head). Perfectly designed shape to fit the grasp. Plug-in usage (no usage of batteries). Gears can skip easily (the speed button glides fast). I think this could qualify for best bikini epilator for coarse hair. Simply because it has a dual head and stops microorganisms to spread (which is crucial for the delicate intimate area). With switching between speeds, you can achieve good results on every curve of the skin. It is long known that Emjoi produces great epilators, so read this article to see other good Emjoi epilators. Yes, I finally found another cute design epilator. I know that functions are way more important, but sometimes you get both looks and functions, as it is with this item – the pink and white product that comes with some extra parts too. It can remove some fine and soft hairs. Three extra parts: trimmer cap, massage cap (for an enjoyable experience with less pain) and shaver head. Has exfoliation brush inserted to prevent ingrown hairs. Cord usage (not used with batteries or water). Slower charging than with other epilators. 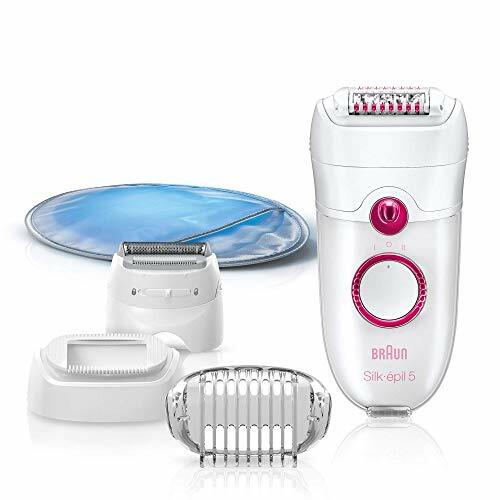 You might think of this as the best epilator for bikini 2019 because you won’t have ingrown hairs. The bikini area will be smooth for weeks and exfoliated nicely as well. Some lotion after that and you got super smooth and shiny skin. I’ve mentioned a lot of Braun epilators, and for good reason. 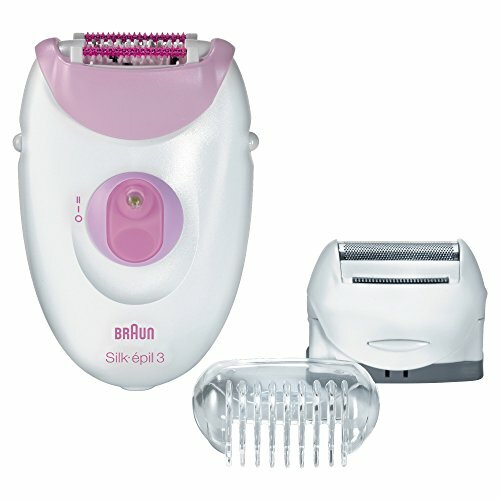 Read here for even more great epilators by Braun. I don’t want to sound boring with my obsession with designs, but this epilator is another one that does a great job and looks cute too. With fading pinks and white for the design, this is a product that offers dry and wet usage and can be a shaver not just ‘pluck-epilator’. 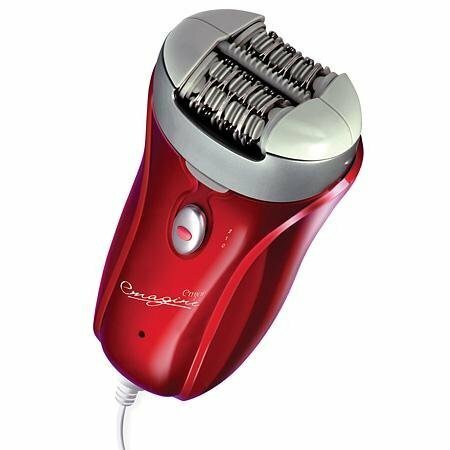 Works as both epilator and shaver with its extra parts. Gentle blades that prevent allergies. Pop-up trimming part (for every hair type in the bikini area). Less discomfort (compared to other epilators). You can clean it with water; fully washable. Charging time of 60 minutes. After 30 minutes it needs recharging (short-lasting operation time). As many others probably would, I, too, would list this item among all those labeled ‘best epilator for Brazilian’. It has all you need – epilation when you have some extra time and can last through this process and shaving option when you literally have minutes to get ready. Plus, the pedicure part will make your feet flawless too. So a bit of a SPA treatment after some pain. Another Emjoi item and again, with dual heads. At the same time, it does shaving, trimming or epilation – you choose. Looks attractive and petite, so you can hold it well and do the hair removal with ease. And it comes in violet or maroon color, which I loved but that doesn’t make it the best epilator for bikini 2019, rather what it does – hello, smooth skin! Skin is smooth for more than a month. Cord usage (no batteries used). Could require more passes on the skin to remove all hairs (since it has a small head). If you need something that has this size and you cannot be bothered with buying batteries, this is a good purchase. Even with more passes on the skin, it is worth it since smoothness will last over 5 weeks. A good quality product that will pamper your skin and make it nice and smooth. You will not be scared of hair removal anymore when there is something like massage or exfoliation along. This one has the ‘relaxation’ feature and could be the best at home pubic hair removal item. Removes even short and strong hairs. Includes a massage option too for better comfort. Good gliding of the head for curves. Dry usage only (not used on wet skin or with water). Cleaning with gentle minor rinse only when unplugged. I had this model for over 2 years. I advise you to use the solid cap for bikini epilating, as the hairs get caught in the one with tiny massage balls. Other than that, definitely one of the best bikini epilators for coarse hair. If you’re a first timer who wants to do a Brazilian using an epilator, this is your best bet. Remington is packed with safety features that fit everyone who crave a safe way of doing the otherwise petrifying act of doing Brazilian. With 40 tweezers and 2-speed settings, you can rest assured of effective hair removal while the moisturizing head and comfort barrels ensure comfortable and skin friendly epilation. Its cordless style means that you can bring this epilator anywhere you feel comfortable, talk about convenience! Rechargeable and can be used cordless. Can be used both for wet or dry hair removal. 2-speed levels to match your hair removal needs or pain threshold. Has a detail, a light for easy viewing. Has a pivoting head to effectively grab hair regardless of the direction of hair growth. The rechargeable battery might need to be replaced within a year depending on how often you use the product. In Conclusion, this is a great epilator. The pivoting head is something that I haven’t seen in other epilators and it’s an awesome feature that minimizes bumps that you can get from epilating in the wrong direction. It especially works great in epilating the bikini line. More Remington? Yes, please! Read this article. A multipurpose tool for a fraction of the cost. 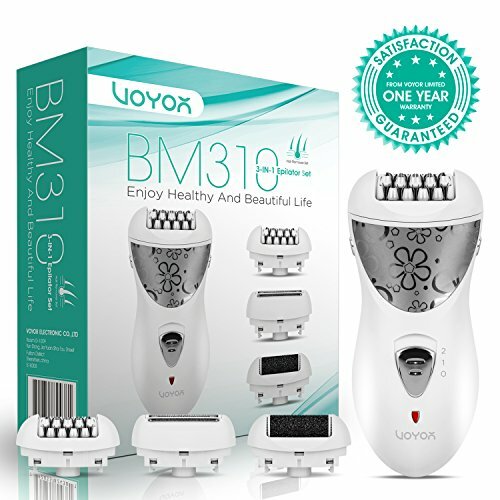 The Voyor hair removal set not only offers effective epilation but also smooth and callus-free skin. With 32 tweezer heads vibrating at 10,000x per minute, it can safely epilate your bikini area in no time. No need to carry multiple beauty tools when you travel, all you’ll ever need is this Voyor hair remover set. Has a total of 32 tweezers and can generate 10,000 vibrations per minute. 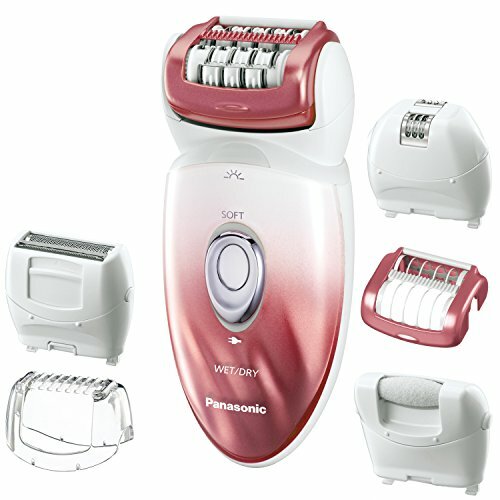 Comes with 3 interchangeable and multifunctional heads (epilator, shaver/trimmer, and callus remover). Hypoallergenic, stainless steel tweezers, razor and foil covers. 6-8 hours initial charging time and 2-3 hours thereafter. This is such a steal given its price. It’s packed with the same features as its high-end competitors and so much more. Given that this tool has a powerful machine and serves superbly in many ways, I wouldn’t mind the long charging time and the fact that I wouldn’t be able to use it wet. If big bulky epilating machines intimidate you, this cute and girly epilator won’t. Don’t be fooled by its good looks though, as it’s packed with a powerful motor and interchangeable heads to meet your hair removal and callus needs. It comes with 4 heads and 2 extra precision covers that work well on your bikini area. You’ll get 6x smoother and hair-free skin compared to manual hair removal methods. 2-speed levels to match the hair type of the area you’re epilating. 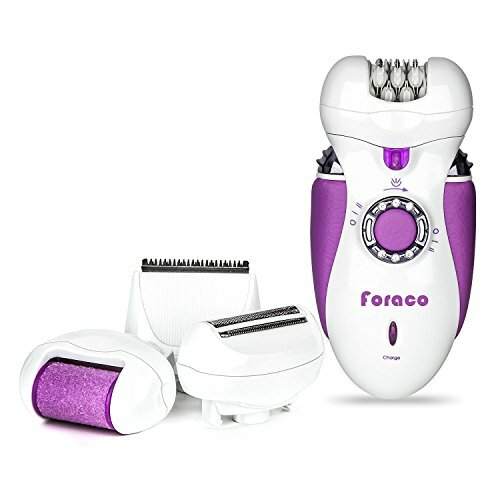 Comes with 4 interchangeable and multifunctional heads (epilator, shaver, trimmer and callus remover) plus 2 clear precision covers. The machine has a loud whirling sound. Although the box says it can be used wet/dry, the instruction manual says that it can’t be used in the tub nor even near the tub. I assume this can only be used dry. All in all, this is a good promising product with a price to beat. I like the convenience of using this product and all the things included in the kit. They can minimize the clutter in your beauty counter as you won’t need different machines for different things. Some epilators may be cheap but lack some useful features (such as the light), but this one packs on amazing features and quality. Definitely a bang for your buck. I hope, by now it is much clearer how to get the best hair removal, as far as we speak of the bikini area. Yes, you can use an epilator for the bikini area. Yes, it is safe and almost the same as waxing. All of the products listed are good quality brands that work even on the shortest or strongest hairs. Keep in mind that the epilator should fit comfy in your hand grasp – that way you can glide it easily on the bikini area curves for a perfect Brazilian. If the product comes with some extra parts, even better. This just means you can benefit from some needed exfoliating or massage on skin. There isn’t too much to remember, don’t fuss too much over it. It’s simple – good skin care after the epilation and good cleaning of the epilator after each use. Two things – focus on the epilator heads/extra parts when you buy it and clean it after usage. With or without water, follow instructions and you’re set. Now it’s up to you to choose which is the best epilator for Brazilian for you, so you can look stunning all the time, save money and be your own salon expert!